"The Uncommon Reader" is such a funny, clever and wellwritten book. It is a book about books; a story of how reading can influence you, posses you and most of all a story of how reading can change you. 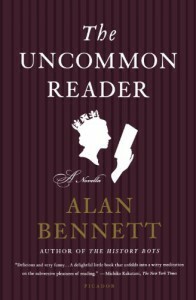 Bennett captures the discovery of books perfectly, and illustrates the progress we make as readers; how Dostoevsky suddenly stops being terrifying and how Jane Austen becomes a dear friend. The complexities of the Queen's reading rises as she sinks deeper into the world of books. This is a brilliant and heartwarming little book. I read it in one sitting, and I enjoyed it from beginning to end. Bennett's ultimate message, that writing trumps reading, is perhaps a bit narrow-minded, but I do understand his point of view.